What a great idea. Let's drive all the way out to White Rock on one of the wettest days of the year for some breakfast! While driving on the freeway and all you see is a wall of water; it's pretty much a bad idea to be driving in the first place. Moreover, if stepping out of the car meant being soaked from head to toe; it's another indication that staying inside would've been more prudent. But it's eating and that is the most important thing here. Not many things can stop me from eating. Even the stomach flu didn't faze me. I was defiant and ate McDonald's, Viva Sue Pizza and Beard Papa's despite my attachment to the ceramic god. Rain! Pfft... Bri ng it on! So why White Rock? Well, I've heard of this little diner called the Five Corners Cafe. It's been there for awhile; but it's under new ownership. I thought that I needed to give it a try. Besides, there is a severe lack of real diners in the GVRD. Escaping the monsoon, otherwise known as Vancouver fall weather, we were greeted by pictures of Clark Gable, Katherine Hepburn and Marilyn Monroe. This is definitely a quaint little diner out in White Rock. The staff are indeed friendly and made us feel quite comfortable. Despite the clock showing a few ticks after 10:00am, I decided to go for one of their "famous" burgers. Naturally, I would choose the biggest, most expensive one being the Roger Burger. Stacked high on a toasted bun, there were Jalapenos, mushrooms, bacon, cheese, a fried egg that essentially dwarfed the homemade patty. Look at the picture, that's not even with the top part of the bun (which includes lettuce, tomato and onion). I found that the patty was not that juicy; but overall the burger was tasty. For $10.0 0, this was a very good value. Think of the Royal Red at Red Robin on steroids. As for the fries, they were crispy; but were a bit generic. potat oes evenly cooked and the toast, crunchy. Trust me, there are places that can't get this right. We were pretty happy with our meals at Five Corners. It's not often you find a place that not only embraces the diner concept, it actually lives it. It's not the best food we've ever eaten and it's certainly not the best burger I've ever had; but the venue, price and portion size help make this a great place to grab some diner food while in White Rock. I beg to differ that there is a lack of quaint old school diners in Vancouver. Why my favorite is Bert's Restaurant on Main near 12th. Have you tried it yet? They make awesome pancakes. It also provides interesting people watching while you eat. That's true Holly, there are some diners in Vancouver. Helen's Grill comes to mind. However, I guess my point of reference is in comparing with the Eastern US, which has plenty. We seem to have very few comparatively. Not sure why. Could it be due to the large ethnic population here? I can never quite understand it. Hi Sherman, I liked your comments on Five Corners; you're right, places like this are the last of a dying breed. I've been going there since my early days in White Rock and have always felt it was just part of the fabric of the town. 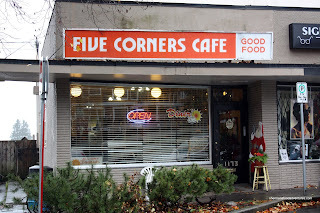 Really like the food and the atmosphere of that place..
Five Corners is the first place we go to when we hit the mainland. Their food is always great and the staff is very friendly.